Controls broadleaf weeds in lawns while feeding your lawn with 35% slow-release nitrogen fertilizer. Three-way action provides superior weed control. 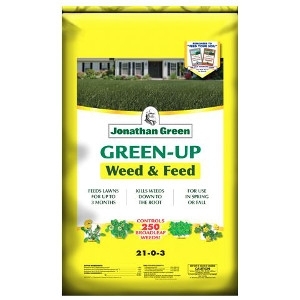 Feeds desirable grasses longer while weeds gradually disappear from the lawn. Apply when weeds are actively growing in the spring and fall. Fine particle size allows for superior weed control and feeding action. Delay seeding for four weeks after applying.